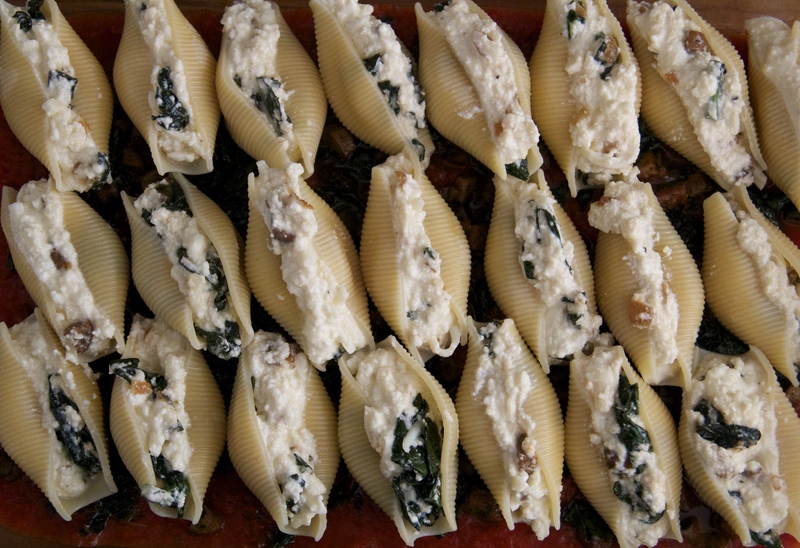 Remember stuffed shells?!? My mom used to make them for my sisters and me when we were kids, but I haven’t eaten a jumbo pasta shell, stuffed or unstuffed, in years. I’m not sure where or how the craving first lodged itself in my brain, but when I saw a box of shells staring at me from the shelf at the grocery store, I snatched it up without thought and headed straight for the cheese section to find ricotta. 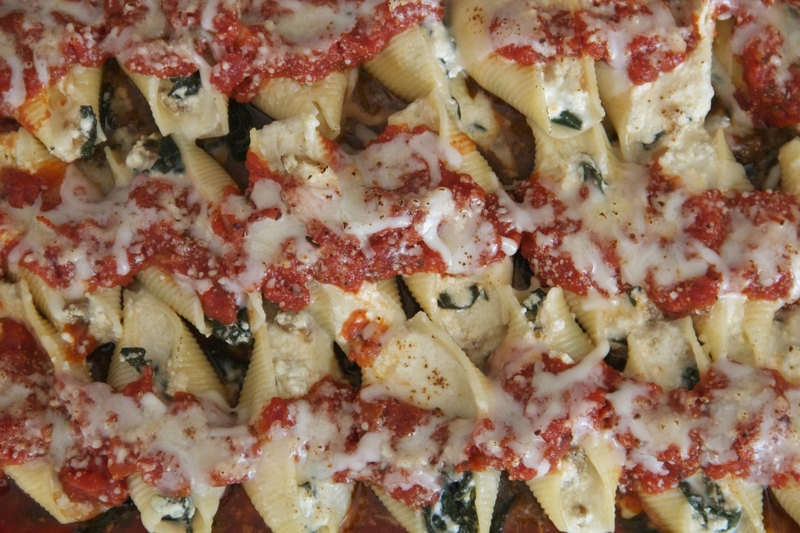 Stuffed shells = happening! After all, I enjoy stuffing things. I mean, there are like twelve recipes in my cookbook for things stuffed in other things… there’s Israeli cous cous-stuffed peppers, thai tofu-stuffed eggplant, salad-stuffed squash bowls… plus I’m always overstuffing my washing machine and then wondering why my clothes are still dirty. So. Mom used to fill her shells with a mixture of different cheeses (yum), but I wanted some protein and greens in there (I’m so adult), so I added some turkey sausage and wilted kale. Good choices, both. They heft up the meal and cut through the richness of the cheese (in a good way – the dish is still plenty cheesy!). Now all I need is a tall glass of apple juice, my two sisters sitting across from me at the table in their feetsie pajamas, and the promise of an episode of Saved By The Bell (the early years) for dessert. …I’m totally kidding I would never accept anything less than a cookie for dessert. Come on, mom. Feel free to make this dish a day or two ahead of time — simply cover with foil and refrigerate, then rewarm in a 350 degree oven before serving. (They also freeze well – just wrap the dish extra well and freeze – and then let the dish sit out at room temp for 30 minutes before popping in the oven). I made this super easy by using a few links of pre-cooked turkey sausage (I can always be counted on to have some Applegate Farms links in the freezer), but you can easily use fresh, uncooked sausage instead. Just make sure to take the meat out of the casing before adding to the pan to brown. Set a large pot of water to boil over high heat, and boil the shells for 9 minutes, until almost-but-not-quite cooked through. Drain the shells on a paper towel-lined sheet pan. Meanwhile, heat a few tablespoons of olive oil in a medium skillet over medium-high heat. Add the onion, and cook until softened and beginning to brown. Then add the sausage, and cook, stirring occasionally, until browned. Next, add the chopped kale, and stir to incorporate and wilt (add a bit more olive oil if needed). Season with a big pinch each of salt and pepper, and the garlic powder. Once the kale is good and wilted, take the pan off the heat and set aside. In a medium bowl, stir together the ricotta, mozzarella, parmesan, and egg. Add a pinch of salt and pepper and stir to incorporate. Set aside. 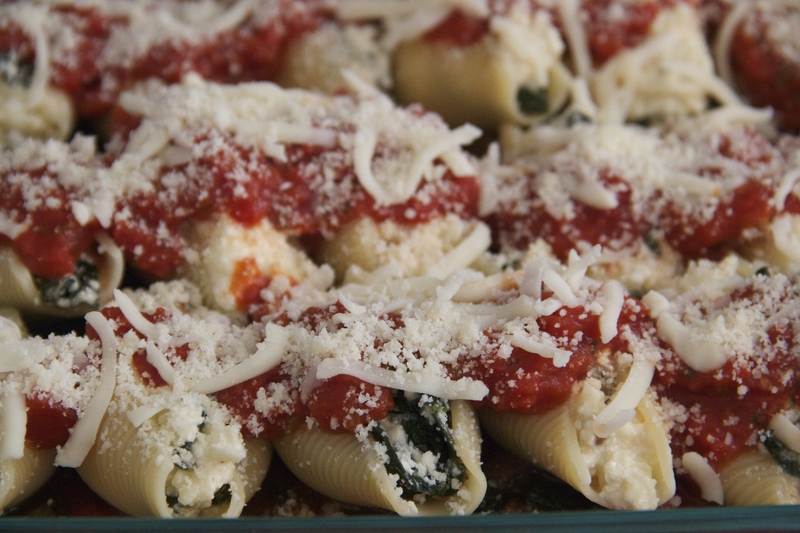 Pour half of the marinara sauce into the bottom of a large Pyrex baking dish, and spread it out evenly. Scatter half of the kale/sausage mixture over the marinara sauce, and stir the rest into the ricotta mixture, until well-combined. Spoon the ricotta/sausage mixture into the par-cooked shells, and place the stuffed shells into the Pyrex dish, over the marinara/sausage mixture. 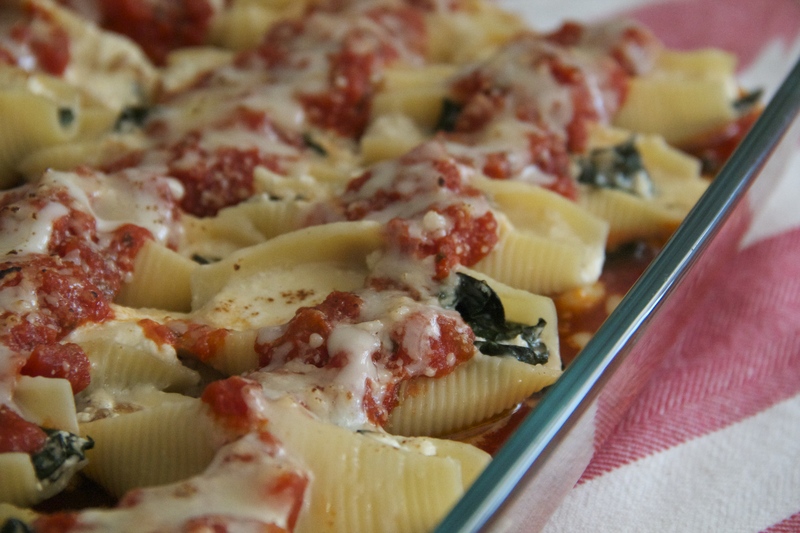 Spoon the remaining marinara sauce over the shells, and sprinkle with some extra mozzarella and parmesan cheese. Cover the dish with tin foil and bake for about 30 minutes. Remove the foil and bake the shells, uncovered, until the cheese begins to brown and the sauce begins to bubble, another 10 minutes or so. Previous Post: « Pie Day Friday! Oh em gee. I want this. Hi Molly! I used your stuffed shell recipe to stuff summer squash from our garden! I upped the turkey sausage (sweet Italian) to around a pound, and since dino kale is not readily available at my local grocery, I just used one bunch of standard kale. I was able to fit a large zucchini and a large yellow squash into my 9″x13″. I cut each squash in half, lengthwise, scrapped out and discarded the seeds. I also cut a thin slice off the bottom side of each squash boat so they would sit nice and flat in the dish. I did everything else as described in your recipe, cooking it until the squash was tender. The result was the best stuffed summer squash that we have ever eaten! I have tried many stuffed squash recipes, but have never found one that I liked enough to keep using it. This is now my stuffed summer squash go-to recipe. I can’t wait to share it with the rest of my family at our annual end of summer gathering. Thank you for your great recipe!